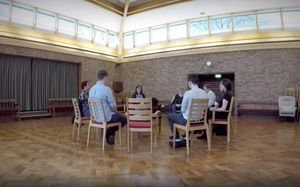 The Young Quakers are a group of young Friends (Quakers) in our 20s and 30s with a diverse set of backgrounds and experiences based all over the UK, including London, Sheffield, Norwich, Glasgow, Wales, and Northern Ireland. We are launching a second season of the Young Quaker Podcast, starting in October 2018, to continue to build community for young Friends that encourages dialogue and understanding, raise awareness of Quaker spirituality and values, and use talking about faith as a starting point to work towards peace and equality. Create community for young Quakers by promoting listening and learning, stimulating meaningful conversations, and providing a space for them to feel listened to and valued. Make Quaker faith more accessible, inclusive, and approachable to all with an internet connection, and encourage interfaith and international dialogue. Empower young Quakers by providing a platform for them to explore their faith, and build bridges of communication and empathy between younger and older Quakers. The Young Quaker Podcast will produce monthly episodes, (with a few bonus mini-episodes thrown in) during October 2018 - June 2019, providing a platform for young people to talk about their Quaker faith and experiences, building community and strengthening connections between young Friends and Quakers more broadly. Podcasting internationally will also hopefully make Quakerism more visible in the wider world through producing an accessible product available worldwide. We have five core content creators who produce the content for the podcasts, pitching the topics, writing and editing the scripts, hosting the episodes and interviewing the guests; three content audio editors who refine and assemble the audio; and one technical audio editor who polishes the audio and adds music. Our second season will also allow us to develop discussions about interfaith relations, and to feature young Quakers from around the world. A more global perspective will enable us to be more inclusive and hopefully stimulate valuable conversations about difference and equality. We will strive to demonstrate the spiritual diversity within Quakerism by featuring a range of views and divine truths, and hope to promote values of empathy, understanding, and learning through a focus on sharing stories. Renewing the podcast for a second season will allow us to expand on and advance our goals for the podcast as a supportive and creative space for young adult Quakers, and empower young people to have open and thoughtful discussions about faith.